Hair Tissue Mineral Analysis (HTMA) is a safe and non-invasive diagnostic test. It measures the levels and ratios of minerals and toxic elements found in hair. Minerals are essential for growth, healing, vitality and wellbeing. They provide structural support in bones and teeth, and they maintain the body's pH and water balance, nerve activity, muscle contractions, energy production and enzyme reactions. Ideally we should get all the minerals we need from a balanced diet but most often this is not the case. Mineral-depleted soils reduce the mineral content of foods, and environmental pollutants, chemical food additives and stressful lifestyles also have a detrimental effect on our nutritional status. 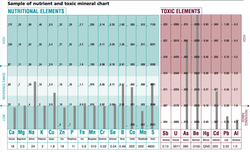 Many health conditions are aggravated by mineral imbalances and heavy metals, including cardiovascular disease, high cholesterol, fatigue, anaemia, thyroid problems, hormonal imbalance, high blood pressure, migraines, allergies, poor immunity, learning difficulties, and hyperactivity or behavioural problems in children. This is a small list of many health problems where HTMA can help assess the cause. Children on the autism spectrum are frequently found to have difficulties in detoxifying heavy metals as well as needing extra nutrients. Jan uses this form of testing to help determine the factors exacerbating this condition in her practice.